Touch screens have made their way into all kinds of gadgets and all parts of our lives, but we want more. We want to take the touch screen to the next level, maybe even move it around and slap it onto different surfaces just to get the ultimate in portability. A Portuguese company called Displax is developing a product called Skin that would turn any non-metal surface – flat or curved – into an interactive touch screen. Are we on the verge of the affordable touch-screen television, kitchen counter computers and stellar presentation tools? 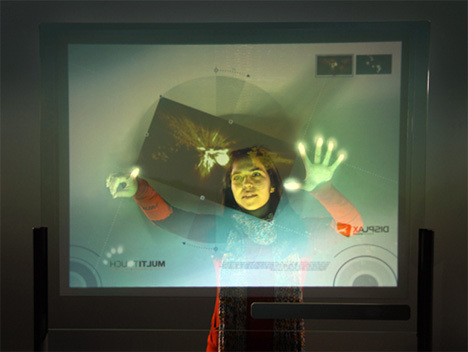 Skin promises to put interactive displays in entirely new places and expand the possibilities of touch screens. The polymer sheet is a mere 100 microns thick – about the thickness of a single human hair – and contains an embedded grid of nanowires. Fingers placed on the sheet cause an electrical disturbance, which the microcontroller analyzes to figure out where the input devices (i.e. your fingers) are on the surface. According to the company’s reps, the responsiveness is awesome – something we’d love to be able to say for some of the touch screen gadgets currently in our pockets. The Skin screen could be placed on just about any object, transparent or opaque, and can even be used through glass. That means that the film could be stuck onto one side of the glass and users could interact with it through the other side of the glass. 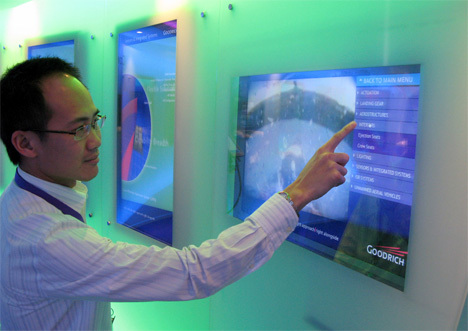 The touch screen is already making its way into consumer products, where it promises to blow other touch screens clean out of the water. So far, no word on whether stick-on, peel-off computer screens will be popping up in stores anytime soon. See more in Industrial Design or under Technology. August, 2010.